Gold Ridge RCD Special Announcement: Keep wood in the creek! Keep Wood in the Creek! Why? Any strong storm can bring down trees, but after four years of drought, this winter we are seeing an especially large number of trees come down. It’s important to know that when trees fall into creeks, they become part of the creek channel in the eyes of the Department of Fish and Wildlife. Fallen trees, as they sit, tumble and turn within the creek, are nature’s creek-architects: they shape the creek’s bed and banks, the way the creek meanders, and how sediment and floating wood debris within the creek move or accumulate; fallen wood also becomes home and shelter to a variety of aquatic wildlife, and in particular, salmon and steelhead. What About Removal? Large wood is critical to the health of a creek for these reasons, but in some cases, it can conflict with the needs of the creekside landowner. 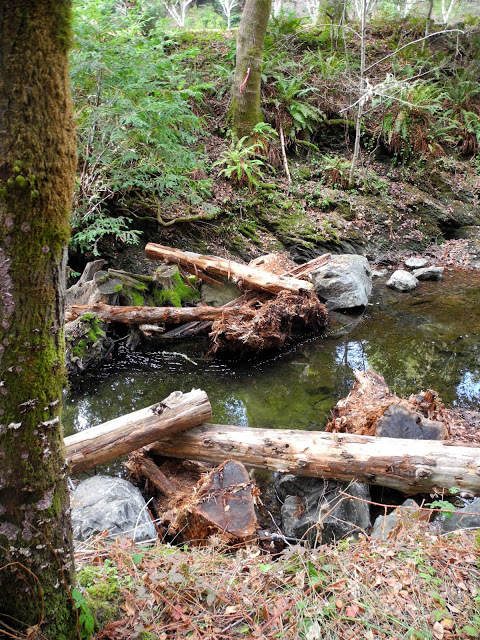 Large fallen wood can sometimes divert the stream’s energy toward a bank, posing a threat of bank failure or other damage, or may have caused serious damage at the time it fell. These might be reasons why a landowner would feel the need to remove fallen wood that lies within a creek channel. Permitting: If you do need to remove wood from a stream, you first need to notify the Department of Fish and Wildlife by filing for a Lake or Streambed Alteration (1600 LSA) permit. As mentioned above, wood changes the creek’s bed and banks when it falls in; by removing it, a landowner is also causing change. The Gold Ridge RCD can assist landowners in filling out a 1600 LSA permit. For landowners who encounter an emergency need to remove fallen wood, they have 14 days after the removal to file an Emergency 1600 LSA permit notification. Please read the instructions for this permit closely to be sure your situation qualifies as an emergency. Before You Remove Wood...Take notice of any large wood situated in your creek. Some pieces of wood are part of structures that have been installed and secured to improve fish habitat by the RCD. If you are removing fallen wood, please do not remove these structures or other pieces of wood that pose no threat to property. Above is a photo of one of the RCD’s many large wood debris installation projects. Learn more about the habitat and watershed benefits of fallen wood in our creeks.